Today's airline artifact is a baggage sticker from Frontier Airlines -- the "real" one, not the current re-creation. 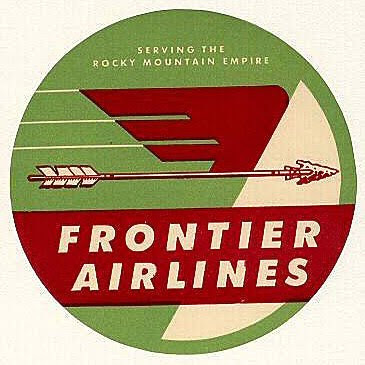 The old Frontier Airlines served Montana from 1950 to 1986 ... I flew it several times in the 1970s and 80s, and decided that it was one of my favorites. Frontier served most of Montana's major cities over the years, but was strongest in eastern Montana. Its network included a long, puddle-jumper circuit along the Hi-Line that lasted until the late 1970s ... long after many other major airlines had abandoned routes like that. This sticker probably dates form the late 1950s or so, and is a classic piece of period graphic design. Growing up in northeastern Montana I use to fly Frontier from Wolf Point and Sidney on a regular basis when I was going to University. It was a great service with the DC-3 and on larger routes the Convair. Great memories! I've never flown on either a Convair or a DC-3 ... I need to figure out how to do that, before it's too late. My father Art (PAT) Key worked for Frontier in Wolf Point and Glasgow 1963, 1964ish. DC-3's is all I used the fly on in the 60's. I got to ride Frontier several times in its last few years, and I thought it was a fine airline. But not a DC-3 into Wolf Point, of course ... that would have really been something!